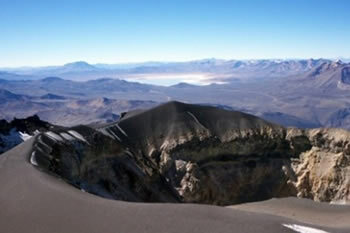 The Misti Volcano allows a fundamental and determining element of beautiful views of the city of Arequipa, being converted into a grand touristic attraction; the region’s characteristics facilitate the ascension of the Misti Volcano and also allow for the practicing of Andeanism – it’s an unforgettable experience that combines the fascinating process of ascension to the summit with its end: the incomparable panoramic view of the city of Arequipa and its surroundings. In order to partake in the volcano’s ascension, it is necessary to be in good physical condition with good physical health. 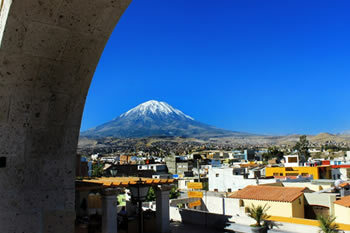 09:00 AM – We will personally pick you up from your hotel in Arequipa to take private transportation for 2 hours to the base of Misti Volcano (3,330 meters above sea level); upon arrival to the base, our porters will be awaiting us to take all of our equipment. We will ascend the volcano softly – the hike is characterized by a springy passage (sandy ground that has the remains of volcanic ash); during the hike, we will stop briefly to eat lunch – then, we will continue our hike towards the base camp (an altitude of 4,300 meters). This walk takes approximately 6 hours; upon arrival to the base camp, we will eat dinner and then set up camp for the night. From our camping area, we will have a beautiful view of Arequipa (especially at night when the lights are turned on throughout the city), as well as the breathtaking stars that we will have the opportunity to see above our heads. VERY EARLY IN THE MORNING – After breakfast, we will start our ascension to the peak of the volcano, walking softly with lanterns for about 4-to-5 hours until arriving to the summit (5,825 meters above sea level); we will be able to enjoy the beautiful passage of the Chachani and Picchu Picchu volcanos, the Reserve of Aguada Blanca, the Salinas Lagoon, the city of Arequipa, and small villages. We will also be able to appreciate an impressionable view of the enormous volcanic crater. The energy that one exerts to ascend Misti Volcano is recuperated by the experience of being able to contemplate the wonderful passage that the volcano allows us to see – having the opportunity to observe the environment and its wonders is completely worth it. Our descension will be much easier because we will descend via the sand that allows for a cushioning of our steps and also for stopping easier when it is necessary; when we arrive to the base camp, our transport will be awaiting us to take us in return to the city of Arequipa. INCLUDED IN THE TOUR: Professional Mountain Climber and Tour Guide; Private Transport; Cooking Service; Mate de Coca; Hot Soup; Mountain Tents; Mattresses; Safety Rope; Alimentation (1 Breakfast, 2 Lunches, 1 Dinner); and, Crampons and Ice Axes (for Necessary Slip Protection). NOT INCLUDED IN THE TOUR: Accident and Travel Insurance; and, Personal Belongings. WHAT YOU SHOULD BRING WITH YOU: Sleeping Bags; Good Mountain Coats; Lanterns with Extra Batteries; Water (4 Liters Per Person); Snacks; and, Strong Backpacks.